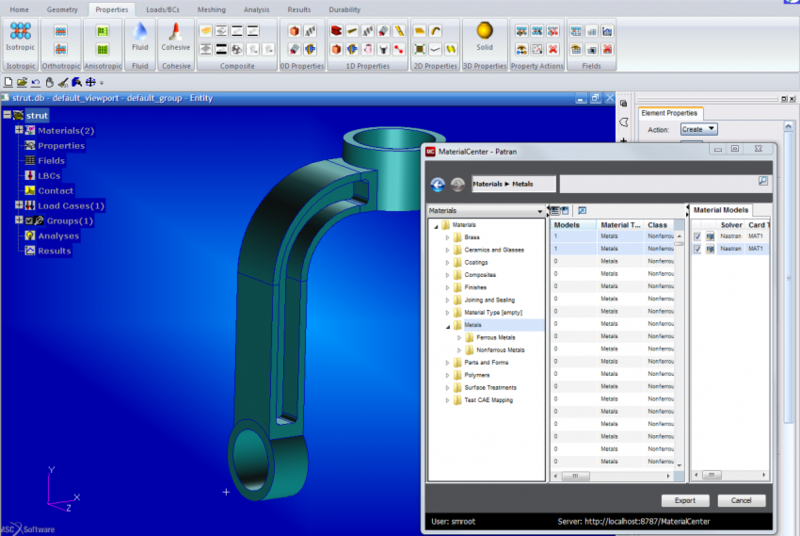 MaterialCenter – a Materials Lifecycle Management System – is designed to link material specialists to engineering simulation. A process and data management system, MaterialCenter automatically captures the data from integrated processes ensuring full traceability across the enterprise and throughout the product lifecycle. MaterialCenter addresses the unique requirements of exponential growth of complex materials in driving product innovation as well as new technology developments, such as additive manufacturing. MaterialCenter works directly with many commercial CAE products including many of MSC’s flagship products such as MSC Nastran, Marc, and Digimat. Drawn from the collective experience of the world’s largest OEM’s, MaterialCenter is the single point of entry for all of your materials related activities including physical test data entry and reduction, multi-scale materials modeling, approval workflow and the export of simulation-ready data to analysis. This guarantees that engineers are using a consistent source of approved materials derived from traceable integrated processes. The result is improved simulation fidelity, reduced data loss and elimination of tedious manual data management activities, empowering engineers to focus on driving new and innovative products. Proven scalability to 100,000’s of processes and petabytes of data ensures that MaterialCenter meets the needs of material and simulation engineers alike for many years to come.